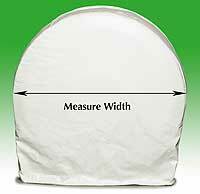 Sold in pairs (2), TireSavers are available in WHITE or BLACK - just measure across the tire for size, there are seven sizes to fit from small trailer tires all the way up to 42" Class "A" motorhomes. Tires take a lot of abuse and can become unsafe if left exposed to the UV rays from the sun and other environmental hazards too long. TireSavers make protecting your tires a "snap". Our exclusive spring-steel ring design holds the TireSavers in place and eliminates the hassle of crawling around on the ground to secure straps, bungee cords and/or other hardware. 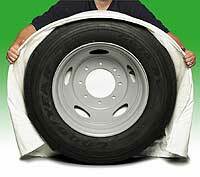 Heavy duty, flannel-backed vinyl protects your tires AND wheels from harmful UV rays, dirt and dust, acid rain, animals and pets.